Kutub [sic. Qutb] & its ruins [including the Quwwat-ul-Islam mosque], Delhi. bl.uk > Online Gallery Home	> Online exhibitions	> Asia, Pacific and Africa Collections	> Kutub [sic. 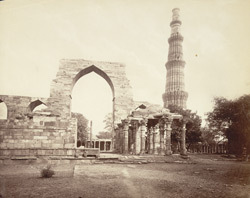 Qutb] & its ruins [including the Quwwat-ul-Islam mosque], Delhi. The Qutb Minar is a tower of victory, part of a complex containing some of the earliest structures of Muslim rule in India. It was begun by Qutb-ud-Din Aibak (r.1206-1210), the first Sultan of Delhi and founder of the Slave Dynasty, and continued by Shams-ud-Din Iltutmish (r.1211-1236). This tower accompanies the Quwwat-ul-Islam mosque of which the remains of the central sanctuary screen arch and arcades are also visible here. The tower was probably inspired by the style of Afghan minarets. It is 72.3m (238 ft) high, and rises in five tapering fluted storeys interrupted by projecting balconies. The chief material used is red sandstone. The two highest storeys are mainly marble, they were rebuilt by Firuz Shah Tughluq (r.1351-1388) in 1368 when a cupola was added, later damaged in an earthquake and removed. The four balconies are interspersed with broad carved bands of interwoven calligraphy and floral motifs.